North view of the Bocardo: Oxford's prison. Foxe's 'Book of Martyrs' says that Nicholas Ridley, the Bishop of Rochester and author of the first English Book of Common Prayer, was "first sent to the Tower, and afterward, at Oxford, was consigned to the common prison of Bocardo, with archbishop Cranmer and Mr. Latimer". 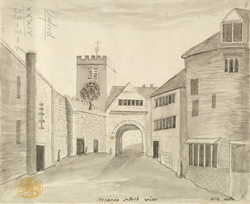 The Bocardo was situated above the old north gate and was destroyed when the city walls were demolished in 1771.